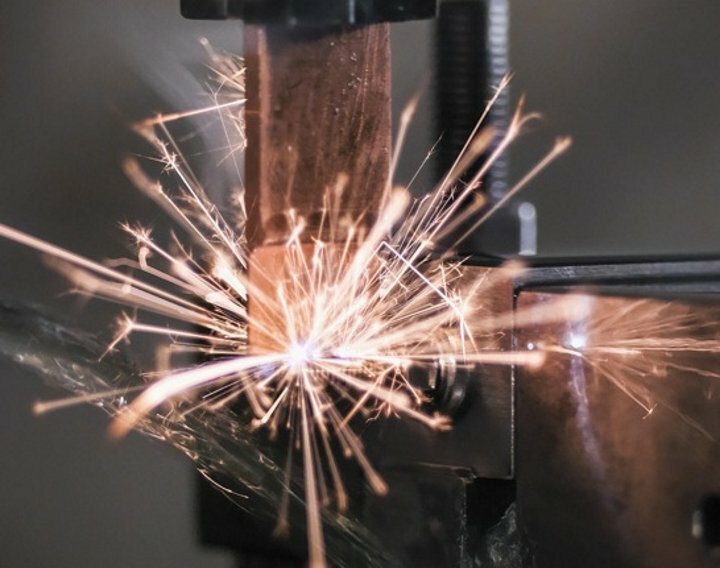 At Bentham & Holroyd we have both CNC wire erosion and spark erosion machining facilities for subcontract work or as part of our full in-house design and manufacturing services. Electrical discharge machining (EDM) is a method primarily used for hard metals or those that would be very difficult to machine using traditional techniques. Also referred to as spark machining, spark eroding, burning, die sinking, wire burning or wire erosion, is a machining process whereby the desired shape is obtained using electrical discharges (sparks) to remove material from an item. Using a series of rapidly recurring electrical discharges between an electrode tool and the desired item separated by a dielectric liquid, the part is slowly eroded to produce the desired complex shape without direct physical contact with the tool. As such EDM can cut intricate contours or cavities in pre-hardened steel without the need for heat treatment to soften and re-harden them. This method can be used with any other metal or metal alloy such as Titanium, Hastelloy, Kovar, and Inconel. Put simply, electrical discharge machining is a clean, efficient method of cutting, resizing and manipulating metal. The process is an entirely non-contact method of machining. As such we are able to create tools and other utensils in extremely fine detail. Producing complex shapes and structures that would otherwise be difficult to produce with conventional cutting tools. Machining extremely hard material to very close tolerances. There is no direct contact between tool and work piece. Therefore, delicate sections and weak materials can be machined without perceivable distortion. Tapered holes may also be produced.